As the arctic air has officially settled (we even hit an extreme cold record here in Montreal earlier this week with wind chill values nearing -40 C! ), I've been getting lots of use out of various skincare products in my arsenal. My extremities have been especially suffering from dryness due to the frigid air that's been dipping into south-eastern Canada and the States, so I'm making the most out of it by taking care of myself, both inside and out (and thankfully have yet to get sick!). 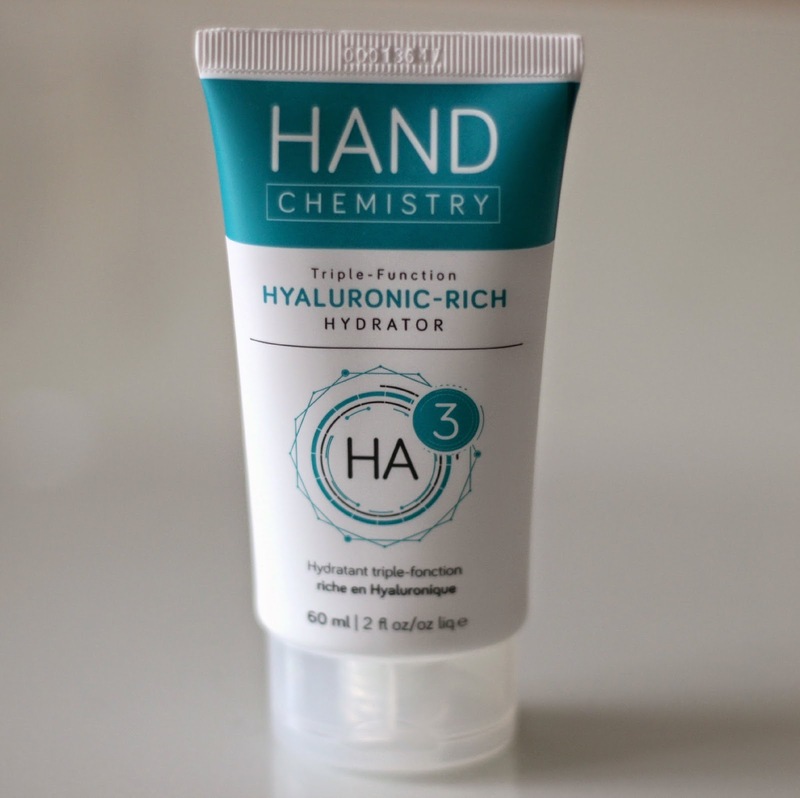 I've previously put the Hand Chemistry Intense Youth Complex Hand Cream* to the test (here), so I had great expectations for their Heel Hydration Complex* and their newest addition, the Triple-Function Hyaluronic-Rich Hydrator*. Keep reading to find out how these performed! The Heel Hydration Complex has come into good use as my heels have been feeling quite dry and in need of some intense moisture. Wearing my heavy winter boots has also contributed to my heels feeling very rough and to me also developing rough skin under my toes. Although I am not at the point of having cracked feet (just yet...), this heel cream is also said to help treat this often irritating and painful skin problem. I've been using this for the last few weeks and have to say my feet are looking significantly better! Not to mention it can also be used on your hands, elbows, legs, and the list goes on. This repair cream also smells very refreshing - quite peppermint-y if you ask me. Formulated with an Antarctic marine 19.5% active complex, it promises to effectively treat the driest of skin. Overall, I am impressed! The Triple-Function Hyaluronic-Rich Hydrator is a purse-size hand cream specially blended to restore moisture into the driest of hands. It is said to go beyond the skin's surface to works its magic, and boasts ingredients such as liquid mango butter, Brazilian Açai and Inca Inchi oil. I've been keeping it in my bag because my hands can get quite dry when I am out and about, and my hands often need a quick boost of hydration. Since the formula absorbs quickly, it's great to carry on the go. This cream also has a very earthy scent, which I really enjoy! 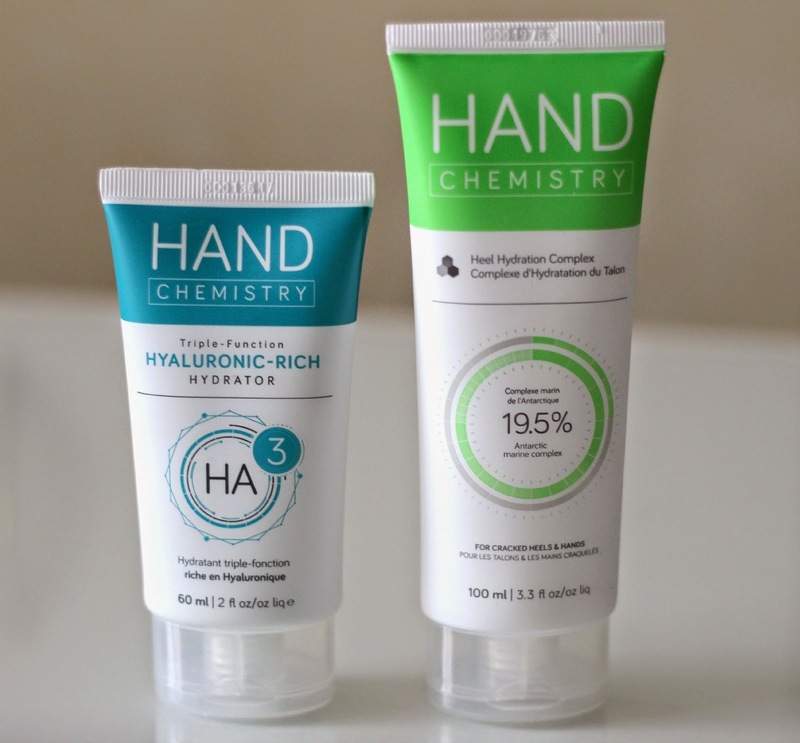 The Hand Chemistry Heel Hydration Complex ($15.00 CAD, 100 ml) and Triple-Function Hyaluronic-Rich Hydrator ($9.00 CAD, 60 ml) have been quite the dry skin saviors for me over the last couple of weeks. 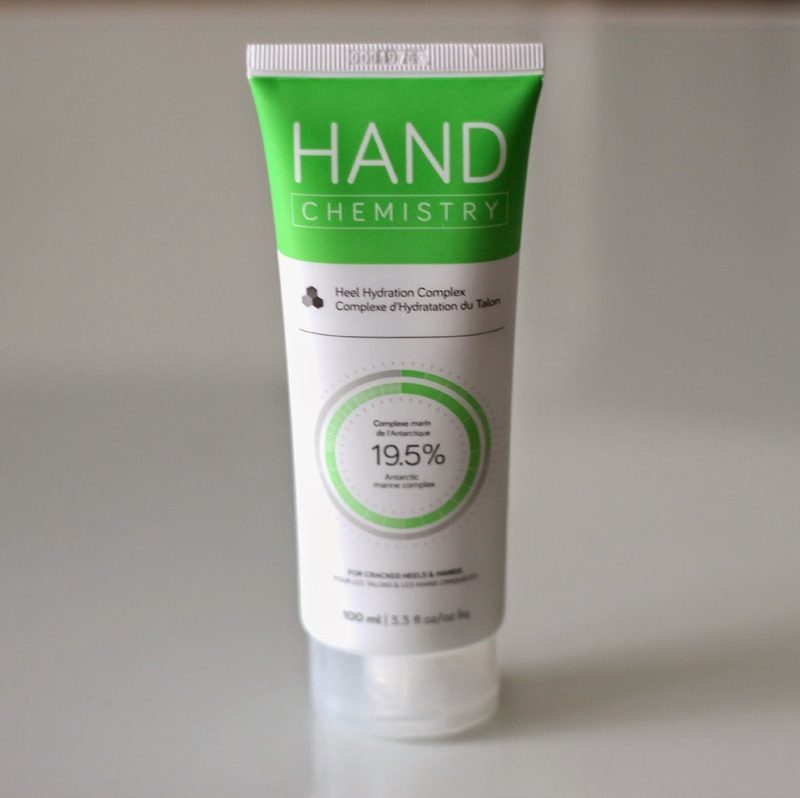 If you'd be interested in trying out the Hand Chemistry line, you can check out their selection online here or pick them up from your local Shoppers Drug Mart in Canada. 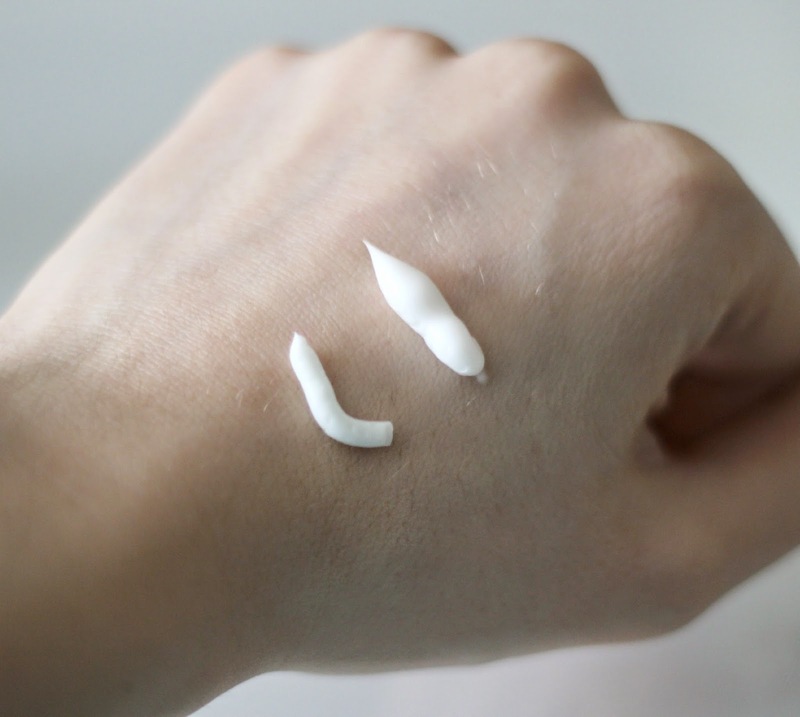 What cream(s) are you currently using?